Every year the Super Bowl comes around. I personally think that this is the best food holiday there is, oh wait, there is this foot ball game too. For me, this is the perfect meal to showcase all of the foods you want to try, but can’t eat all at once, but on this day you can put anything together and it works. 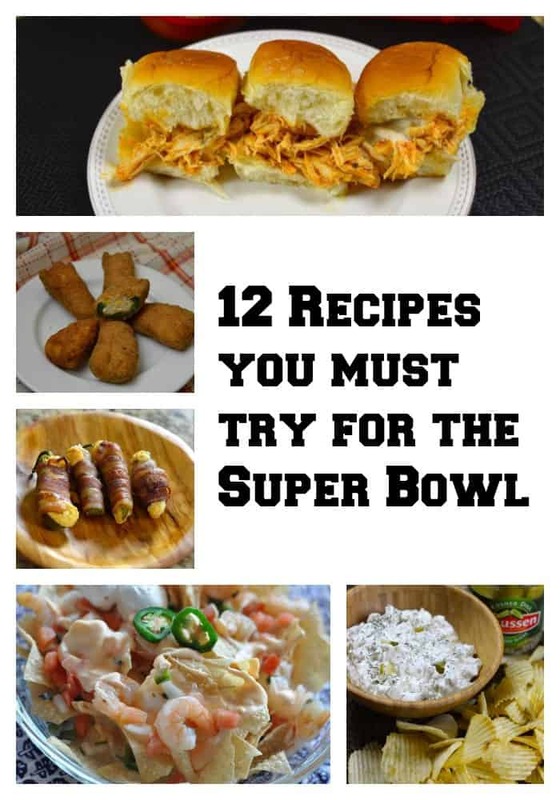 I think there are some definitive recipes you simply must try for Super Bowl. You want to serve an epic spread for your Super Bowl guests, or perhaps you want to bring a dish to someone’s house. Here are 12 recipes you must try for Super Bowl. All recipes are well tested and loved. You can’t go wrong with these recipes. For me, this is the one holiday where you can enjoy all of the appetizers that you desire. Dips, chips, and cheese seem to go along with the Super Bowl just like the great commercials that you see. Pickle Dip – Do you love French Onion dip? You will love pickle dip, this recipe is so easy to put together it will simply take a few minutes. What is the big secret here? Use really good pickles and you will be in business. Ina Garten’s Pan Fried Onion Dip – So I can’t mention a French Onion dip without suggesting my favorite onion dip of all time. I don’t know why, but there is just special about dipping crispy potato chips into creamy flavorful dip. Hooters Hot Wings – Love these? You can make them at home. You need to provide your own Hooters girls. Seven Layer Dip – This is seven layer dip as you have never seen it before, don’t miss this. Here thanks to the CupcakeProject this seven layer dip looks like a foot ball. Jalapeno Poppers – You can make these at home, and guess what, they taste even better than they do when they are served out. Frantastic Jalapeno Poppers with Bacon – You can’t go wrong with this one, these are perfect if you have a grill going, jalapeno poppers are wrapped with bacon. Red Lobster Shrimp Nachos – It can’t be a Super Bowl without Nachos. These classy nachos are easy to prepare and taste so good. Rotel Cream Cheese Dip – This Rotel dip is the one no Super Bowl party can be without. These has something extra in it cream cheese and more is so delicious. Buffalo Chicken Poppers – I know, this really should be called the jalapeno popper holiday, but here we combine bacon, buffalo chicken, and jalapeno peppers. Mississippi Sin – Never had this the French bread stuffed with cream cheese, cheddar cheese, and more, simply heaven. TGI Friday’s Mozzarella Sticks – these aren’t hard to make from scratch. Buffalo Chicken Dip – a very easy dip to make, serve this one warm. Buffalo Chicken Sliders – Love the hot wing flavor don’t like the mess? These can be made in either a pressure cooker or a crock pot, you choose. All of the spicy flavor without the mess. Tangy Sweet Chipotle Meatballs – The ever popular cranberry and chili sauce meatballs with a kick. BrowneyedBaker Artichoke Spinach Dip – this dip is one of the best Artichoke Spinach Dips I have tried. ClosetCooking Pizza Dip – This dip is beautiful it looks just like a pizza, and it tastes incredible. The PerfectPantry Curry Dip – This is a wonderfully savory dip that goes so well with veggies and more.